New York: Cambridge University Press, Jan 2019 ISBN: 9781108595841 Download a flier with discount (US$23.99) to order direct from CUP. Authoritarian populists have disrupted politics in many societies, as exemplified by Donald Trump in the U.S. and Brexit in the UK. Authoritarian populist parties have gained votes and seats in many countries, and entered government in states as diverse as Austria, Italy, the Netherlands, Poland, and Switzerland. Across Europe, their average share of the vote in parliamentary elections remains limited but it has more than doubled since the 1960s and their share of seats tripled. Even small parties can still exert tremendous ‘blackmail’ pressure on governments and change the policy agenda, as demonstrated by UKIP’s role in catalyzing Brexit. The danger is that populist rhetoric undermines public confidence in the legitimacy of liberal democracy while authoritarian values actively corrode its principles and practices. 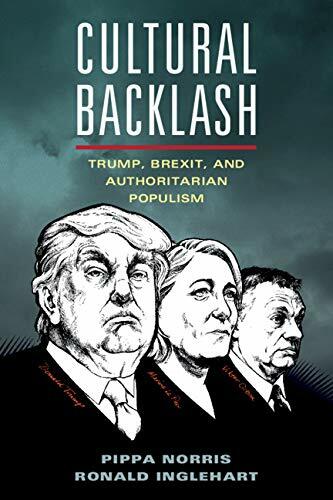 This book sets out a general theory explaining polarization over the cultural cleavage dividing social liberals and social conservatives in the electorates and how these values translate into support for Authoritarian-Populist parties and leaders in the U.S. and Europe. The conclusion highlights the dangers to liberal democracy arising from these developments and what could be done to mitigate the risks. Populism is defined as a style of discourse reflecting first order principles about who should rule, claiming that legitimate power rests with 'the people' not the elites. It remains silent about second order principles concerning what should be done, what policies should be followed, what decisions should be made. Authoritarian values endorse the priority of tough security to protect the tribe against threats from outsiders, adherence to conventional group norms, and loyal obedience to tribal leaders. The danger of this combination is that Authoritarian-Populism corrodes principles and practices at the heart of liberal democracy. Unshackled by checks and balances, claiming to speak for 'the people', strongman leaders trample upon norms of live-and-let-live fair play, constraints on partisanship, the protection of civil liberties, and the value of consensus-building; the importance of a bright line clearly separating personal and political interests; the unambiguous rejection of political violence and the active defense of human rights; the value of tolerating a multicultural diversity of lifestyles, beliefs, and ideas; and the importance of cosmopolitanism, open borders, and multilateral cooperation. It is worth emphasizing that not all populists are authoritarian, and not all authoritarians are populists, by any means. The establishment can also be challenged to advance a progressive agenda. But Authoritarian-Populist parties and leaders blend both these potent appeals.